Most of the time when we erase files on a computer, we just drag them to the recycle bin or press Delete. And for most files, that’s fine. However, deleting files like that doesn’t actually remove them from your hard drive. All it does is updating the file directory to remove the entry for that file and making the space it occupied available for other files. That means that the file can be recovered using any decent file recovery tool. That might be good news for files you delete accidentally, or later discover you need, but it’s a nightmare for dealing with sensitive data. Securely erasing files on Windows 10 involves more than just removing the file’s entry from the directory. It must be overwritten multiple times until it’s completely unrecoverable. That way, no disk recovery software will be able to get it back and you won’t have to worry about anyone finding anything they shouldn’t. If, for example, you run a business and store customer details, when it’s time to remove those details to comply with data protection regulations, you should securely delete them, rather than just dragging the file to the Recycle Bin. Also, if you plan on selling your PC or giving it away, you should securely delete all files that contain personally identifiable information, relating to you or anyone else who’s data you hold. This is very important in order to avoid identity theft. There are a couple of ways to securely erase files on Windows 10. To delete files securely you may use a built-in tool called Cipher, accessible from Windows’ PowerShell command line interface. You should replace “Users\Kenny\Documents” with your username and the name of the folder you want it to apply to. If you’re not sure of the file path of the folder you want to securely erase data from, navigate to it in File Explorer and copy the path from the address bar in the window. Using a command line interface, even when it’s relatively simple, isn’t for everyone. Some of us would rather not have to deal with typing commands at all and would rather stick to using a comfortable user interface. Fortunately, there is a tool that allows you to securely erase files using a much more user-friendly interface - CleanMyPC. Not only does it allow you to erase files securely, but it has several other features that help you give your PC a clean up. The files you selected will now be overwritten. 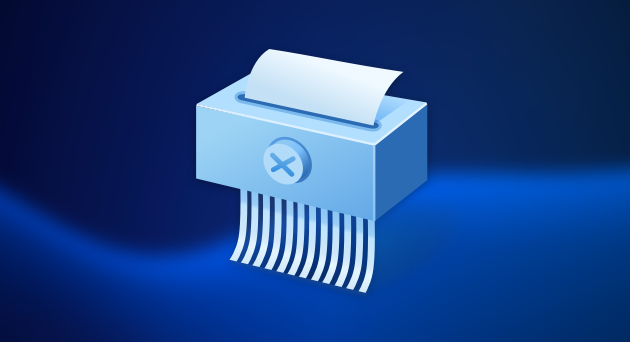 You can also invoke CleanMyPC’s Shredder by right-clicking on any file and choosing “Secure Erase by CleanMyPC” from the shortcut menu or by dragging it to the bottom right-hand corner of the screen. Securely erasing files is an important part of keeping your data secure and maintaining your privacy. There’s a big difference between dragging files to the Recycle Bin or pressing delete, and erasing them securely. With first method you merely make the space the files occupy available for use, and the files can be easily recovered. The second writes over them multiple times so they can never be used again. CleanMyPC makes it very simple to erase files securely and has multiple other features to make your computer safer and cleaner.